David talks with Winemaker Adam LaZarre, who has a long and storied career in the wine industry. 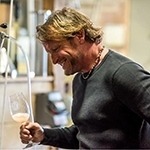 His accomplishments are too many to mention, but in addition to the wines he has made for many large brands (Rex Goliath, Cycles Gladiator, Hahn Estates, he and his wife Angie have been making their own wines for many years under the name LaZarre Wines. The brand was started in 2003 primarily as a high-end, single-vineyard Pinot Noir project and has grown to include such varietals as Merlot, Albariño, Sauvignon Blanc, Vin Gris, and Chardonnay.